Recently, I bit the bullet and painted my sitting room pink. I'd had a slightly obsessional craving to do so for a while but I had a free day and it all kicked off. I've been collecting vintage plates for years and was desperate to get them up on the wall but wanted a contrasting colour to put them against. Plus I'd hammered about 50 nails into the adjacent wall with my ever evolving 'gallery wall' and taken out half of the plaster, meaning that I'd reached a point that only paint would fix. Miles my decorator wasn't booked until June and he's always massively busy so the only thing to do was to do it myself, something I wouldn't usually attempt in public areas due to the fact that my decorating skills are akin to a five year old. I decided against telling Miles that I was going to do it myself in case he had palpitations and immediately sent the Interior Police round to arrest me for crimes against decor. Botanics and pink - a match made in heaven. Coincidentally, in conjunction with my pink decision, last week I visited Sketch on Conduit Street to have afternoon tea with my Mum. If you haven't been there, I absolutely suggest that you book immediately because the decor is TO DIE FOR. Designed by hugely talented India Mahdavi, the Gallery (which also houses a collection of David Shrigley artwork) is a heaven of velvet pinkness unlike anything you've ever seen. It's 1970's meets Missoni meets Beverley Hills and has a copper sheet bar that I could sit at all night (I don't need much of an excuse, tbh). For me, it reaffirmed my decision that pink was the way forward for my York sitting room. The words 'York sitting room' don't have quite the same ring as 'cool London trendsetting restaurant' but my visit reassured me that I was on track. The fabulous Gallery at Sketch. My Mum and I drinking champagne. I had trialled a couple of tester pots but none of them really did it for me. I wanted a proper pale pink, more girlie than some of the darker toned ones that are on the market. My Bargain of the Century red vintage Natuzzi sofa wasn't going anywhere but I've always loved red and pink together so was pretty sure it would work. To back my decision up, I messaged Bianca of French For Pineapple blog aka Queen of the Colour Combo who confirmed that it would indeed look fab. As always, I've gone for a cool, calm and restrained colour palette. Jokes. At this point, can I say that I had made no suggestion to Joe whatsoever of my plans. I get lots of people messaging me about their partners vetoing colour schemes and what should they do about it. To these people, I say, IGNORE THEM. Do not discuss your plans with partners. Make no mention of your intentions. Do it when they are out and it's a nice surprise when they return. My hallway is wallpapered in Deco Palm pink and gold colour way. Did I show Joe my choice prior to ordering it? Nope. Obviously not. Does he love it? Of course he does. He has no choice as it's already up. Job done. Neon pink. Tick. Tropical print. Tick. Fringing. Tick. My Love Frankie lampshade and I are a match made in heaven. The lovely people at Frenchic had sent me some paint samples and one of these was Ballerina. Frenchic have been around only a couple of years but they've hit the market running with an unbelievably reasonably priced chalk paint. Cool upcyclist Max McMurdo is their Brand Ambassador and it's eco friendly with only natural ingredients which means there is no odour whatsoever. It goes on like a dream. From the moment I slapped it on the wall, I knew that it was the one for me. Once I started slapping, I couldn't stop. Before I knew it, I had done an entire wall and there was definitely no way back. My room was pink. Joe arrived home. He barely noticed. Thus proving my point to always go with your gut and ignore the dissent of others. I updated my Vittsjo IKEA black shelving unit with Rustoleum Bright Gold spray paint. Pink is HOT. Everywhere you look, pink is definitely having a moment. Teamed with the Pantone Colour of the Year, Greenery, it provides a ideal back drop to natural tones and textures and is the perfect way to take us into Spring. Did you know that the colour pink is often used in prison holding cells to reduce erratic behaviour due to it's calming properties? Perfect for my house, quite frankly, which quite often resembles an episode of 24 Hours In A&E. So how can you incorporate this colour trend into your own home? Whether you are brave enough to do a full room or just want to have a hint of pink in your current decor, there's options for everyone. Whether you go for the whole shebang or just a feature wall, everyone needs a bit of pink in their space. Dark side lover but want to give it a go? Panic not - the combination of pink with dark looks seriously effective and really brings an edge to your walls. Michelle Matangi's monochrome artwork and furniture look perfect against her blush walls. Theobert Pot has combined pink walls with dark grey to great effect and the natural textures that he has used only serve to perfect the space. Amy from This Style Rocks has painted pink above the picture rail and taken it up, over and on to the ceiling. Kim DTI has nailed the full pink walls - totally gorgeous mixed with mid century furniture. Pink is the colour of the day and accessories haven't missed out on the trend. The stores are full of fabulous homewares that will add colour to your decor without having to go the whole hog. Vintage Amy adds a retro lampshade and pink cushion. which look stunning against the green of the walls. 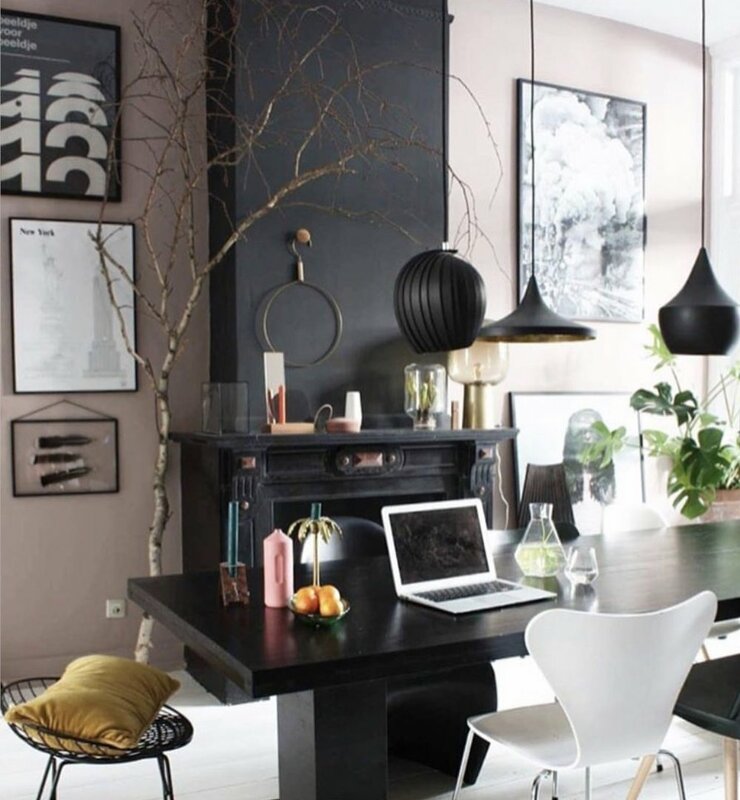 Textural pink sheepskin against black walls looks totally stunning at the home of Cowboy Kate. Melanie Lissack has brilliantly upcycled this petal lampshade in ombre pink. If you want to know how to duplicate this look, go to her website. Why stop at paint? There are some amazing papers on the market that can transform your space and introduce tones of pink, whether you want to be really subtle or are going for a totally in your face pink statement. Pink rules in this room at the home of Kimberley Duran of Swoonworthy blog. Mixing the pinks looks fantastic and seriously effective. My hallway wallpaper is a good contrast to the dark grey in the corridor which could be overwhelming without the colour pop. Pink, grey and green are the perfect combination. Wallpaper by Woodchip & Magnolia. It doesn't need to be stand out pink to make an impact. This wallpaper from The Loft & Us has a subtle pink interwoven into the pattern. Use pink as an accent colour. Picking out something that wouldn't usually be a feature is really effective. The examples below show how thinking outside the box can really take your decor to the next level. 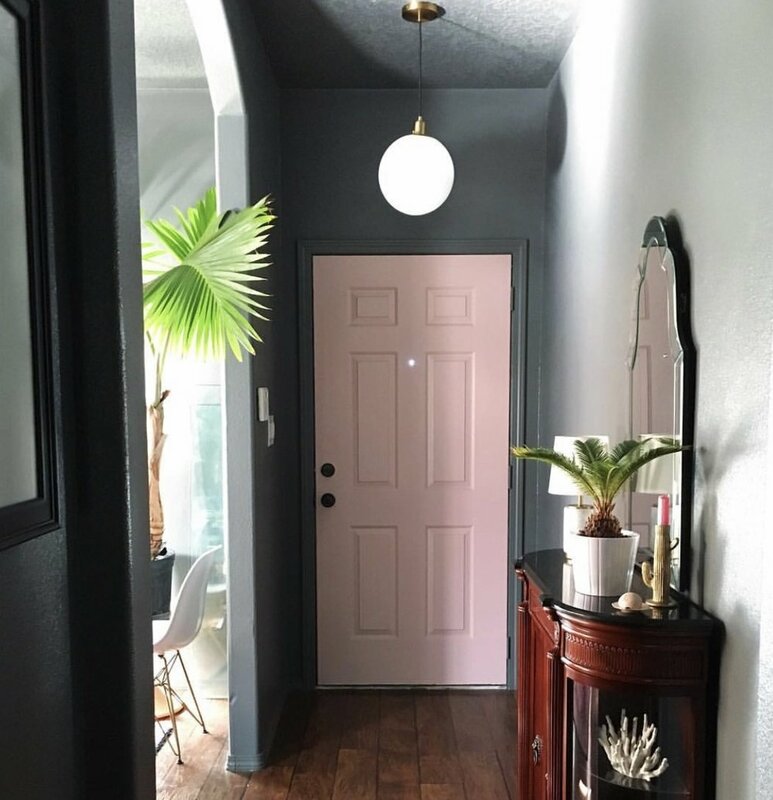 Nichol Naranjo has effectively combined dark walls with a pop of pale pink for her front door. Kate Watson-Smyth has used pink unexpectedly on the fireplace and trestles. Tamara Lee has made her pale pink sofa the focal point for her huge gallery wall. Cara Irwin of Goldalamode blog has used pink to make her front door stand out from the pale walls. Pink isn't everyone's bag. In a recent survey across Europe and the USA, only 2% of people said that pink was their favourite colour. In fact, 17% said that pink was their LEAST favourite colour. The response from family and friends to my new pink room has been diverse and it's definitely a marmite choice. But hey, interiors should be fun and it's so much cooler to stand out from the crowd. As Mark Twain said, 'Whenever you find yourself on the side of the majority, it is time to pause and reflect'. Pink is a statement and I'm sticking with it. For now, at least.